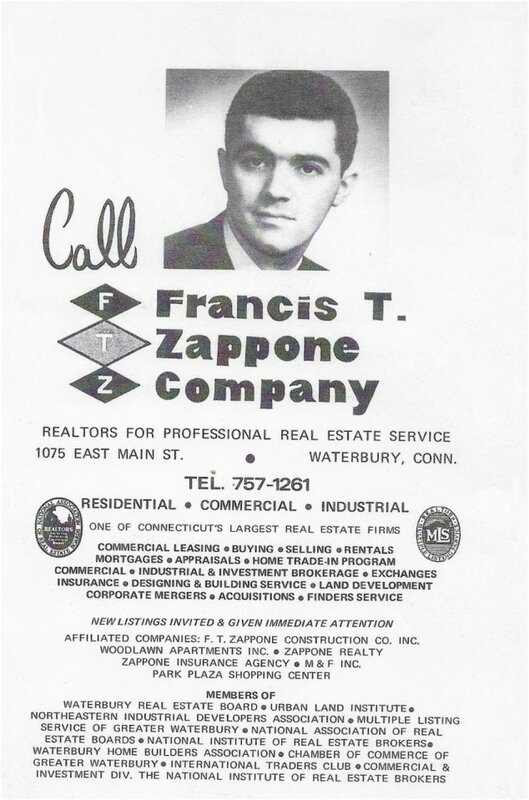 The Francis T. Zappone CO. was established in 1963 by Francis T. Zappone. Since its inception the company has grown into a totally diversified Real Estate company with agents specializing in Residential, Commercial, Industrial, and Rental properties, as well as Real Estate Investments, Consulting, Business Brokerage, Construction and Property Development. The Brokerage Division is one of the most respected in the area, combining a wealth of experience with the latest computer technology to design the most effective marketing plan for each unique property. The Company is also active in residential and commercial relocation services, providing people new to the Greater Waterbury Central Connecticut area with all the assistance they require to make their transition successful. The Francis T. Zappone CO. is also a leader in REO and Bank Foreclosures, working with numerous lenders and financial institutions from around the country. REO transactions are varied and have included homes, condominiums commercial and industrial properties as well as a 264 unit lender-owned apartment complex in Kissimmee, Florida, near Disney World. The Company has also brokered numerous Residential, Commercial, Industrial and Retail properties for the FDIC and other Local STATE and Federal Agencies, as well as private owners. In addition to Connecticut, the Company is licensed in Florida, with brokerage affiliates in several other states. Francis T. Zappone CO. is a present and past member of Waterbury Real Estate Board (former Director and Vice President), Urban Land Institute, Northeastern Industrial Developers Association, Multiple Listing Service Of Greater Waterbury (former Director and Vice President), National Association of Real Estate Boards, National Association of Home Builders, National Institute of Real Estate Brokers, Waterbury Home Builders Association (Charter Member), Chamber of Commerce (Past Director), International Traders Club, Commercial and Investment Division of The National Institute Of Real Estate Brokers. Francis T Zappone was named as a REALTOR EMERITUS by the National Association of Realtors. The Company and its affiliate corporations have also designed, constructed, managed, and owned numerous projects, ranging from single-family homes to large multi-unit apartment complexes and developed residential subdivisions, shopping centers, office buildings, retail structures and multi-use projects. One notable transaction of recent years was the sale of 232 units in Waterbury which was converted to condominiums, valued at over $18.5 million. The complex was built, developed, managed and owned by Mr. Zappone, who holds undergraduate and graduate degrees in Real Estate Management, Business Administration and Legal Studies. 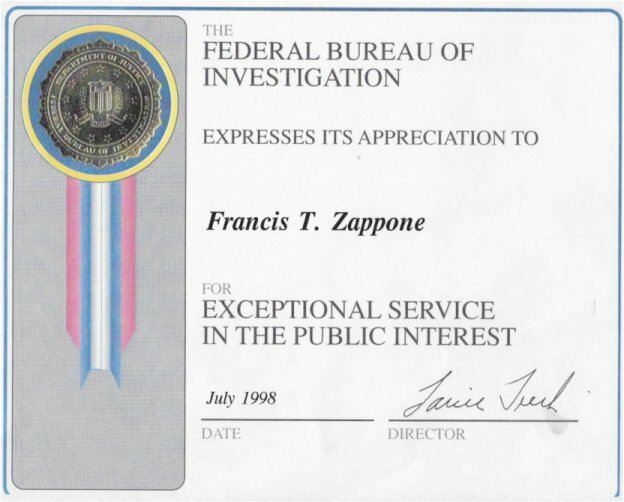 As the Company celebrates over five decades of professional service, it is important to note what has made Francis T. Zappone CO. so successful and respected: a commitment to excellence, integrity, honesty and the ability to effectively handle all facets of the Real Estate Industry. A copy of one of our early ads.